The Saturday morning controlled burn operation was delayed due to weather. Work proceeded and burn operations are in progress. Over the next 48 hours, crews will be working to complete, mop up and secure the line along the north and east side of the fire. In a separate development, unrelated to the controlled burn operation, strong winds out of the east pushed the western flank of the Dollar Lake fire to the west in the Mt. Hood Wilderness. By Saturday afternoon, the fire had spread as far west as Cathedral Ridge and the Mazama Trail area. As soon as the winds subside and smoke clears, fire personnel will develop a more accurate assessment of fire location and size. The winds out of the east are predicted to diminish later today.Smoke has been heavy and is visible as far west as Portland. Smoke and falling ash have been reported in the Lolo Pass area. 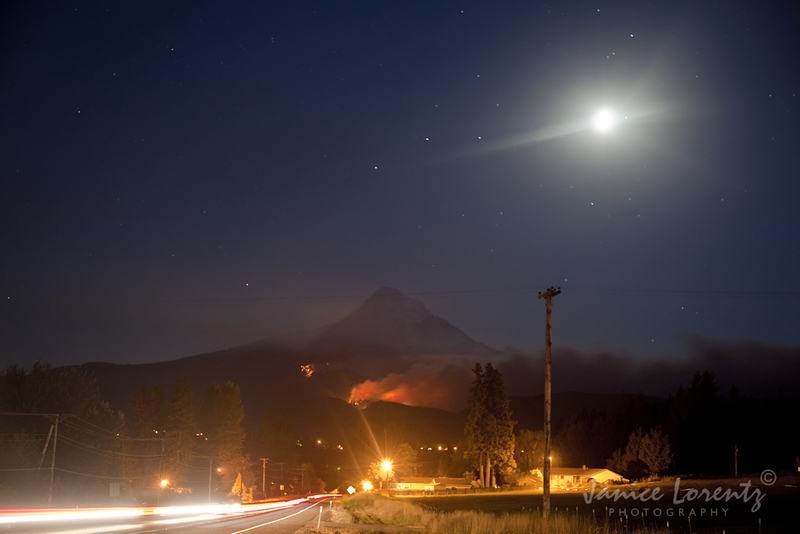 Fire officials are working with the Mount Hood National Forest to identify recreation sites, trails and campgrounds that could be affected in the days ahead. As a precautionary measure, recreationists are being asked to pack up and leave some areas. Three air tankers and three heavy, two medium, and one light helicopter are working the fire. Retardant drops have been approved for Wilderness suppression as part of the aggressive firefighting effort.On the north and east sides of the fire, crews continue to monitor and mop up yesterday's controlled burn. The burnout operation is designed to strengthen fire lines and increase the protection of county and private lands.Protection of historic structures continues with a task force of engines and an extensive sprinkler system in the Tilly Jane and Cloud Cap areas. Always impressive to watch, albeit a bit sad, since a lot of reasonably health forest appears to have gone up along with the stuff that really needed to burn. I'm sort of holding my breath to see what it looks like once the smoke clears. Oh, and I also assembled this photo sequence from the USDA gorge cam today, since what we really saw (apparently) was a major flare-up of the fire, beginning mid-morning. That's when I decided to head over there, after looking at the cam! Is that a 2nd fire? Basically, the entire northern half of Hood is now off-limits, including Ramona Falls and McNeil Point. Only the ski areas and Paradise Park are still open. An area closure is in effect on Mt. Hood National Forest due to the Dollar Lake Fire. Several trails and a few campgrounds have been closed to protect the safety of the public. Unfortunately, the public is advised that all closed trails and campgrounds within the closed area are expected to remain closed for the entire Labor Day Weekend. However, the vast majority of trails and campgrounds within Mt. Hood National Forest and outside the closed fire area are open to the public. The following trails and campgrounds are closed. * Vista Ridge Trail #626, Elk Cove Trail #631, and Pinnacle Ridge Trail #630, and all minor trails depicted within the Forest Fire Closure Exhibit A (link to map provided above). The following campgrounds are closed: Lost Lake, Wahtum Lake, McNeil, Riley Horse Camp, Lost Creek, Kinnikinnick, Tilly Jane, and Cloud Cap. The Timberline Trail is also open between Mt. Hood Meadows and Timberline Lodge. It is also possible to hike on Gnarl Ridge Trail #652 to the junction with the Timberline Trail #600. However, the Timberline Trail is closed beyond this junction toward Cooper Spur. The Timberline Trail is open from this junction in the west and south direction toward Mt. Hood Meadows. Wow. They closed Lost Lake on a Labor Day weekend..! I'm surprised there wasn't rioting up there..! From Highway 35 this evening. I was surprised how much of the lower slopes were impacted when I saw them tonight, but your photos really show the area impacted. Great shots.